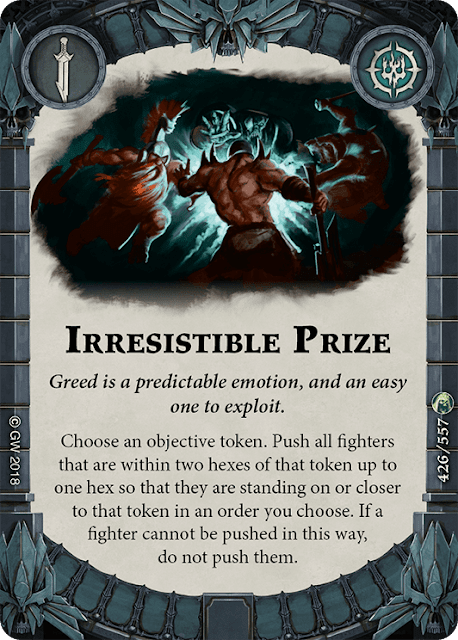 Decision: Should you play Irresistible Prize? Gitz should consider Irresistible Prize highly, as they benefit in multiple ways from its inclusion. Cursebreakers probably have the next strongest reason to select it, though any defensive deck can benefit from the "snaring" property of Prize. Dwarves, especially those that include Supremacy or the like in their deck, should also probably pack this ploy. Finally, all hold-objective decks should be thinking about including Prize, as it works directly toward their goals. The most obvious use for Irresistible Prize is to move your models on to objective tokens. This is of great use to hold-objective type decks, as it can be used both to set up scoring positions when you are short on movement (attn: Sepulchral Guard) and to put your models back on objectives that they have been pushed off of. This tactic can also be useful for non-objective focused Dwarf decks, as you can use Prize to inspire your fighters. However, all of the above goals can also be accomplished with Sidestep. For us to consider Irresistible Prize useful, it really does need to do something more. When trying to find other uses for Irresistible Prize, it's important to note that it affects both friendly and enemy models. Since losing Great Concussion to the Banned and Restricted List, both hold-objective and passive/defensive decks are in search of cards that can create space between multiple models at once. While hold-objective decks will likely use Prize more for placing your own models onto objective tokens, passive/defensive decks can use Prize to delay the enemy advance. Though Prize is not able to completely duplicate Great Concussion's ability to disperse models, it can be used in a similar manner if we plan ahead. The key here is to set up your board and objective tokens in such a way as to be able to affect multiple enemy models at once. Obviously, you aren't always able to dictate board setups; however, if you do find yourself placing the first board, you'll also be able to place the first objective. 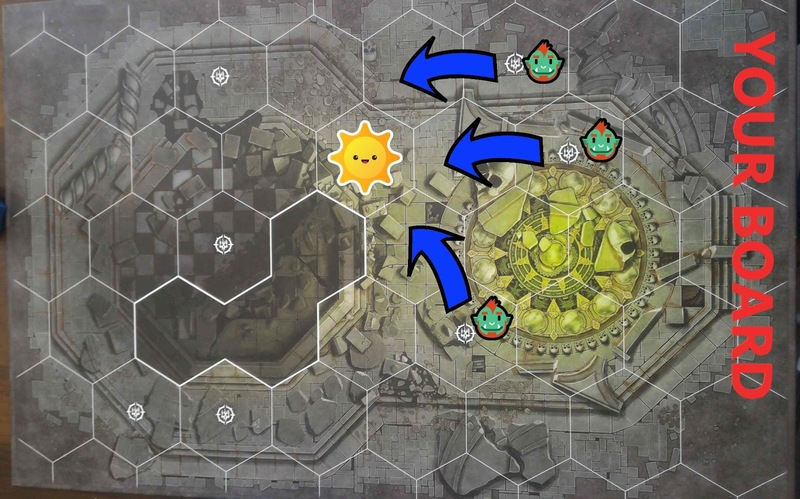 In either scenario, it may be worth it to place the objective token on the opponent's board, on the far side of the starting hexes you think your opponent will most likely deploy to. Then, set up your other objectives in between your models and the enemy. The example above shows how this might work - it represents your opponent's board. Three nasty, dirty orcses are set up to rush onto your board. You have placed your objective token onto your opponent's board during setup where the shiny little sun is. Now, you can use Irresistible Prize to snare all three orcs backward before they get a chance to charge in. While this may seem minor on the surface, good defensive players know that a single hex of delay can mean a whole turn where the opponent can't interact with your models. With a little preparation and some educated guesswork, Irresistible Prize can provide that hex of distance against multiple bad guys. Should you find yourself up against a defensive warband, you can also reverse this process to pull multiple models forward at once. Back in the days of yore, there existed a awful video game called Everquest (which you can experience in all its original terribleness here). One of the only ways to make the game palatable was to use specific techniques to power up your characters faster than you would be able to otherwise. For Wizards and Druids, that technique was "quad kiting" - using snares to force enemies into tight groups and then blasting them all down at once with spells. For a couple of warbands, Irresistible Prize can allow you to do something similar. Both Gitz and Cursebreakers have access to long range Area of Effect damage through Curse of da Bad Moon and Cry of Thunder, respectively. If you don't mind putting your caster in the thick of things, Rending Scream, Chain Lightning, and Rend the Earth can deal damage to large numbers of grouped enemies as well. Finally, since Prize can pull models onto objectives, it can also enable Sphere of Azyr and Lethal Ward. While this probably isn't reason enough to play Irresistible Prize on its own, anyone playing Prize should consider these options to add additional utility. The most obvious alternative to Irresistible Prize is Centre of Attention. The cards share a lot in common: the ability to draw models together, the same range and distance pushed, and the necessity of a "focal point" to move all affected targets toward. The differences between the two cards are subtle, but may prove important in certain situations. First, Centre of Attention is likely to have more potential targets for its "focus" than Prize. You'll only ever have 5 (perhaps fewer) objective tokens on the board, while it's quite likely that there will be more than 5 models on the board at any given time. That said, in particularly violent matches or those between low model-count warbands, Prize may actually have more targets - as objective tokens are significantly harder to remove than fighters. 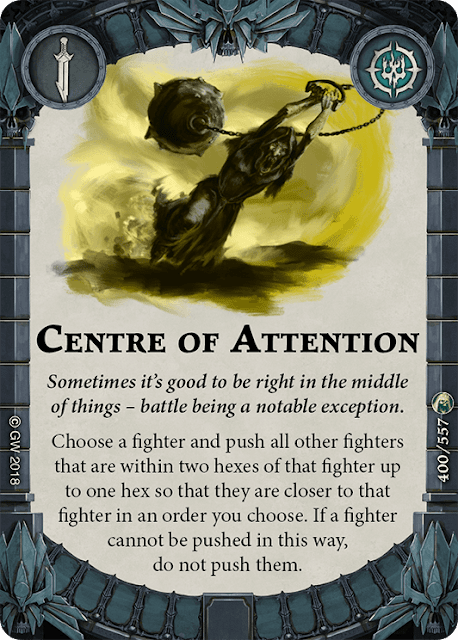 Centre of Attention also grants you the ability to improvise where you are pushing fighters by moving the initial focus target. This can prove advantageous if your opponent does something unexpected. While Prize requires more pre-planning, it does allow you to start your focus at a place of your choosing in your opponent's territory, something that Centre can't do. Finally, Prize can potentially push one more model (though this is not likely to ever be relevant) and can push models onto the focus hex - something Centre can't do because that hex would necessarily be occupied. In the end, the cards are very similar, and anyone playing one would be well served to consider playing the other as well. 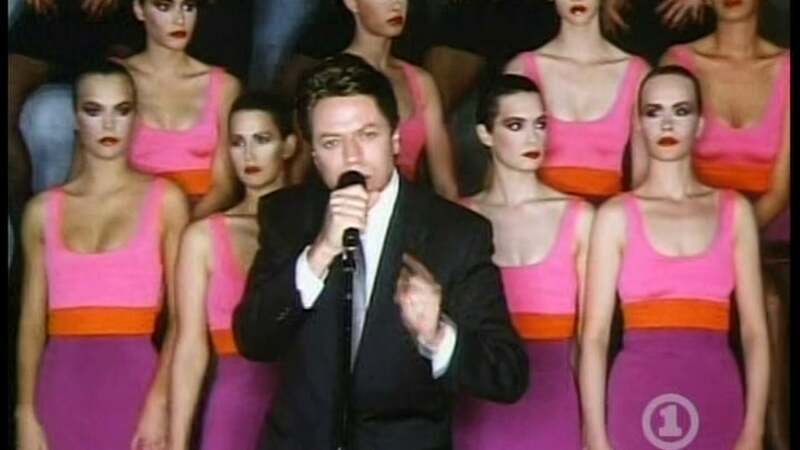 Irresistible Prize provides what all good ploys should provide - versatility. It can group your units (Gitz), provide support for defensive decks (Stormcast), push models away from yours (defensive), pull models closer to yours (vs. defensive) and set up objective scores (hold-objective). Additionally, it can set up a few devastating - if hard to achieve - combos that can result in several models taking lots of damage without the opportunity to defend themselves. Gitz should obviously consider it as a way to set up Scurry, and other warbands seeking to create space or utilize area-damage spells should also think about adding it to their decks.